This new swivel vent mount works in all vehicles, using horizontal vent louvers. 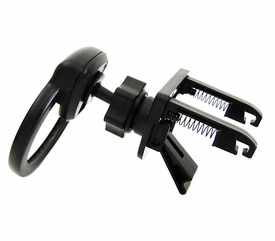 This mount will allow you to turn your TomTom GPS left, right, or rotate 360 degrees. The removable air vent pedestal can be moved easily from vehicle to vehicle without damaging your vents, when used properly. It's the perfect travel companion. Attaches to your vehicle's air conditioning vent without tools. Mounting your device from the vent means that it will be conveniently at arms reach.